One of the most beautiful sections of the Lake Michigan Circle Tour is found in Leelanau County, which is actually a peninsula northwest of Traverse City. Home to many fine wineries, you will definitely want to spend more than a day on Leelanau Peninsula. This is where you'll find the very famous Sleeping Bear National Lakeshore, with spectacular views of Lake Michigan and 35 miles of coastline. The communities that comprise Leelanau Peninsula each offer something unique and interesting to the visitor. A small village of only 400 people, Empire swells during the summertime due to it being the gateway to Sleeping Bear National Lakeshore. Make your first stop at the Philip A. Hart Visitor Center, just east of Empire on M-72. View the exhibits and dioramas, ask questions of the staff, or pick up a brochure and map to help guide you through the park. Take M-109 to the Pierce Stocking Scenic Drive, a seven mile stretch that shows you the highlights of Sleeping Bear National Lakeshore. Be sure to stop off at the Lake Michigan overlook, giving you fantastic views from 450 feet above lake level, and only the ambitious dare to undertake the Dune Climb. Vacationers may want to visit Empire in May, for the annual Asparagus Festival. Continue north on the Lake Michigan Circle Tour along M-22 until you arrive in Glen Arbor, home to three bodies of water...Lake Michigan, Big Glen Lake, Little Glen Lake. Spend your day on the water, lie on a clean beach, or listen to the sounds of a summer concert. Art galleries abound in Glen Arbor, where you can spend the day shopping for treasures. The downtown district will amaze you with the variety of specialty shops, and you'll find the finest food in area restaurants. Grab a glass of local wine, sit back and be amazed at the fiery sunsets. See why so many people choose Glen Arbor as their vacation getaway. Leland takes you back in history...especially when you arrive in Fishtown. Rustic shanties that are now home to various shops have stood the test of time and give you a feel on how life was 100 years ago in the commercial fishing business. Leland is where you can catch a ferry to the Manitou Islands. North Manitou Island is the larger of the two, lies 12 miles from Leland and does not allow motorized vehicles. You can enjoy wildlife and plants in their natural habitat while you sit in quiet solitude. South Manitou Island is 16 miles west of Leland and is a bit more active. Visit a shipwreck, lighthouse, and Coast Guard Station. The beaches and parks are both beautiful and numerous in Leland, and try to take in one of their big events, like the Wine & Food Festival, held annually the second Saturday in June. In the northern-most part of the Leelanau Peninsula is the aptly named Northport, one of the earliest settlements in the county. The hills surrounding Northport are filled with cherry and apple orchards. Traveling up to the tip of the peninsula is Leelanau State Park and the historic Grand Traverse Lighthouse. Browse art galleries and antique shops in and around Northport, or find an original petoskey stone along the beaches. Although not a well known town, many famous people have lived in Northport or enjoyed summers in this beautiful northern village. As you wind your way south on M-22, you'll discover the charming village of Suttons Bay. Their downtown region is rated high among visitors as being very "walkable" and having so many specialty shops in which to explore. As in so many of Leelanau County's towns, Suttons Bay has many trails in which to hike or bike and lush vineyards that produce some of the tastiest wines in northern Michigan. There are at least six galleries for the art lovers, or hop aboard the Inland Seas Tall Ship for a cruise on the bay. Choices for lodging in Suttons Bay range from cozy bed and breakfasts to family cottages...you'll feel comfortable and right at home. If you're in Suttons Bay on August 31, 2013, join the Guinness Book of World Records Challenge for the World's Largest Raft of Kayaks and Canoes. Current record is 1,903 boats; in 2012 they had 1,750. Paddle into the record books! 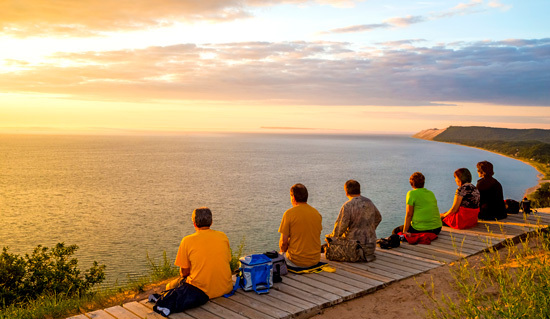 As you'll discover, traveling within the Leelanau Peninsula is one of the most beautiful and interesting regions of the Lake Michigan Circle Tour. Please "Like" Us on Facebook.